Mija and Pilchard went to the vet today. This is the first time they have left my house since I brought them here in September of 2009. Val would just stuff both of them in her carrier and off they'd go. But in giving me her carrier, that meant I had two and I think that's better owing to their size. Mija started in this one. When I got home from work, I brought the garbage and recycling cans back from the street and brought in the mail. I did not give them the treats I usually do. That's not wholly unusual. They sometimes don't get their evening treats until I make my supper. I went to the closet and pulled out the carriers. Mija heard the door rattle on this carrier and she took off. I found her by the back door. She was shaking. She was scared. 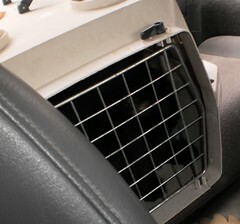 It pains me to have to pick up a quaking cat but they have to ride in the carriers. They cannot be loose in the car. Then I went to get Pilchard. I don't know any cat that likes to ride in the car. None of the cats I had prior to these two did and these two don't. Pilchard was beside herself. Val said she has always been more than a little upset to be in a car. The yeowling that came from her carrier was unnatural and very eerie. She broke the top latch on the carrier in trying to get out. That would not have been good at all. Granted this carrier is nearly 30 years old as we got it when we had Shakespeare, but she dug at the door and when that didn't work, through herself against it. 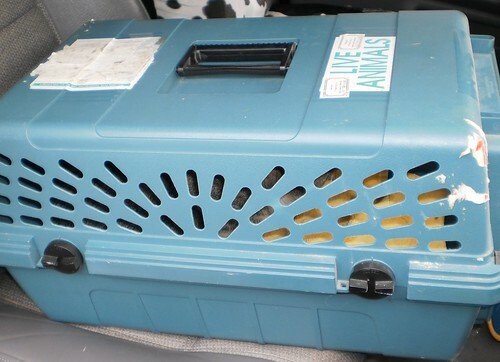 On the way home, cats were reversed in carriers. While Mija complains, she just sits down. Animal Medical has moved out of the building where I started going many years ago. They are renovating the upstairs of it, a former bank building, so all patients are in the basement. Familiar faces were still there so although the digs are new the care is not. It's still the same wonderful people. Of course, Val was there to see how the ladies are doing. They both got their nails done and had blood work and weight. Then they endured the exam. Mija is 11.62 pounds. That is .62 pounds more than when they were seen 2 years ago. Pilchard is 13.54 pounds, not the 17 I thought she was. That is, I think, .02 pounds more than 2 years ago. We don't need shots until the fall. Both should be around 10 pounds so they have a bit of weight to lose. Pilchard needs a dental exam as she has some tartar build up that has to be removed. I also need to comb her more often and add fish oil to her food to help with the dandruff in her coat. She's a bit greasy on her back near her tail. She might have problems reaching that area so I need to give her a good combing. She always looks so much nicer too, if I can get her to hold still while I comb her. What also made me feel good is that everyone told me how happy they were Val was giving her cats to me. Everyone said, "You're the best person we know to take cats and it's clear you're doing very well with them." I did wonder if they would adapt to my lifestyle. We have done very well. They trained me and I've trained them. Those comments make me feel very good about the care I give them. I gave them quite a bit more in treats tonight when we got home. Pilchard took off and went into the basement to yeowl for a few minutes until I gave her treats. Mija went into the closet for a few minutes until I shook the container. We're friends again. 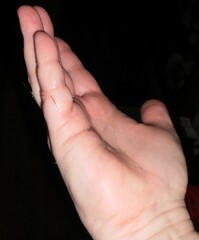 Next time I have to take them to the vet, Pilchard is crated first and I need to carry bandaids in my purse. Let's just say this scratch wasn't as bad as it could have been.